It’s also good news for auto workers, and for everyone who benefits from the spending power that goes along with middle-class manufacturing jobs. 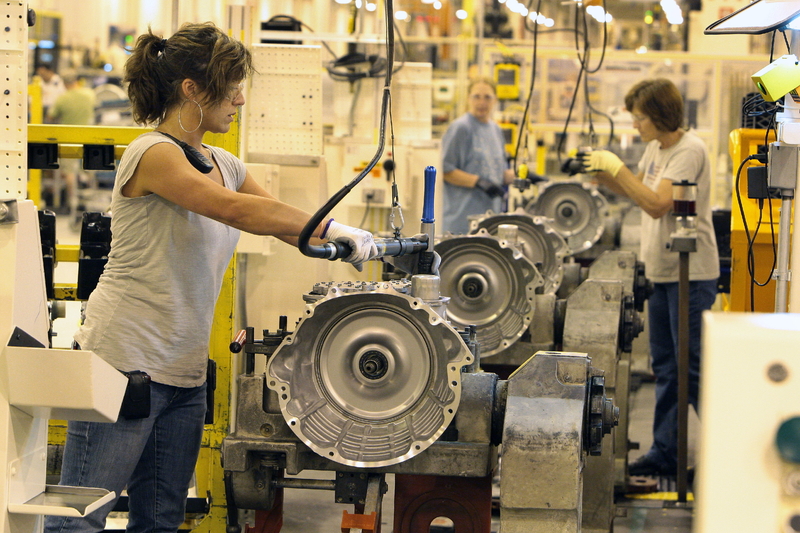 The new transmissions will be manufactured exclusively by UAW members in Indiana: at the Kokomo Casting Plant, the Kokomo Transmission Plant, the Indiana Transmission Plant, and – starting next year –the new transmission plant in Tipton. Previously, Chrysler had relied on an 8-speed transmission for the Cherokee built by German manufacturer ZF. An United Auto Workers member working on transmissions produced at Chrysler’s Kokomo Casting Plant. Kokomo was the obvious place to roll out production. “Chrysler has been building transmissions in Kokomo since 1956,” Mayne pointed out. Jobs and more jobs: Building in-house has allowed Chrysler to beat a top competitor to the market. As the Detroit Free Press has reported, the new Cherokee will be on the market before the 9-speed, ZF-equipped Range Rover Evoque. And by producing the ground-breaking gearbox themselves, Chrysler is adding 1,250 jobs at the Kokomo and Tipton plants. Chrysler has also added jobs to build the components that go with the 9-speed gearbox. The torque converter paired with the transmission is manufactured at Chrysler’s Toledo Machining Plant in Ohio. That plant currently employs 880 people, and the company announced in April it will invest $19.6 million to produce more converters. Also, the Pentastar engines used in most Cherokee models are made in Michigan at the Trenton North Engine Plant, where Chrysler announced last fall they will invest $40 million for a new assembly line. Finally, the Jeeps are assembled at the Toledo Assembly Complex, which is adding a second shift and 1,100 new jobs to meet demand. Higher and higher: Higher-speed transmissions allow for a smoother driving experience for consumers. They also save drivers a great deal of money at the pump. Analysts say the jump from 6-speed to 8-speed transmissions resulted in up to 10% gain in vehicle fuel economy. Chrysler has included additional fuel-saving features on the new Jeep Cherokee, including a new engine, its new FWD-based rear-axle disconnect , and other improvements yielding an overall 45% improvement over the recently discontinued Jeep Liberty. The drive to innovate for fuel savings comes from consumers — 88% of whom say fuel economy will be an important factor when buying their next car — and automakers’ need to meet new federal rules requiring a fleet-wide average of 54.5 mpg in 2025. Advanced transmissions like Chrysler’s nine-speed model, says Natural Resources Defense Council Transportation Program Director Roland Hwang, provide an example of government regulations spurring industry innovation.”Not only are you saving money on gasoline, but you are also getting technology that will give you a better driving experience,” he said. While Chrysler has made no official announcement, CEO Sergio Marchionne told reporters in January that we could expect 200,000 vehicles with 9-speed transmissions this year, including the Dodge Dart and the 200 midsize sedan. GM and Ford are moving fast to get on the higher-gear bandwagon: they announced in April that they will be jointly developing advanced 9-speed and 10-speed transmissions. As reported in the LA Times, research firm IHS Automative predicts that by 2020, transmissions with more than seven speeds will be found in 54% of new vehicles, up from just 2% in 2010. The Environmental Protection Agency’s Edward Nam sees even more gears in our future, saying that 90% of vehicles will have 8-speed or higher transmissions by 2025. A shift in shifting? Some car companies – such as Toyota, Honda, Nissan, and Subaru – have taken a different approach to achieve fuel economy: the continuously variable transmission (CVT). It uses belts and pulleys to make small gear adjustments, as if it had an infinite number of gears, for each small change in load on the engine. Whichever strategy wins out in the marketplace, consumer demand and new federal standards will continue to spur drive-train innovations that decrease fuel consumption, carbon emissions and our need for imported oil – while increasing the availability of good-paying manufacturing jobs. David Isaacson is a free-lance writer based in Chicago, Illinois.